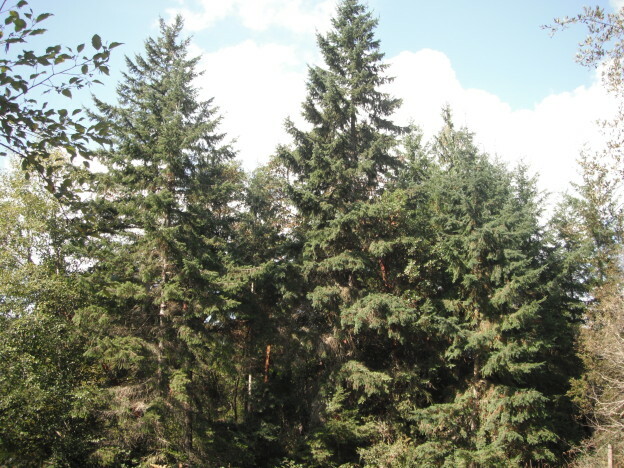 Names: Douglas Fir is named after naturalists, David Douglas and Archibald Menzies. The genus name, Pseudotsuga literally means “false hemlock.” It was once known as P. taxifolia (meaning yew-leaved). Relationships: It is one of only five species in its genus. 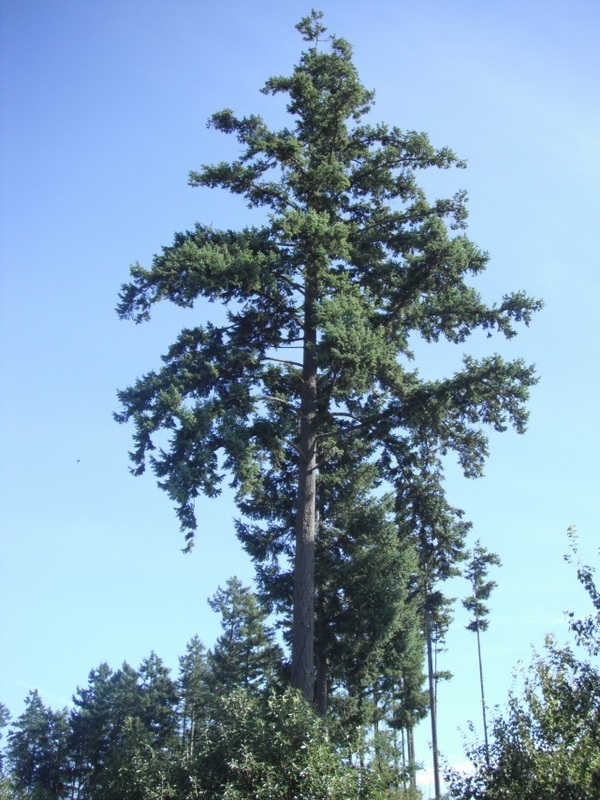 Three species from Asia and the other, Big Cone Douglas Fir, Pseudotsuga macrocarpa has a limited distribution in Southern California. 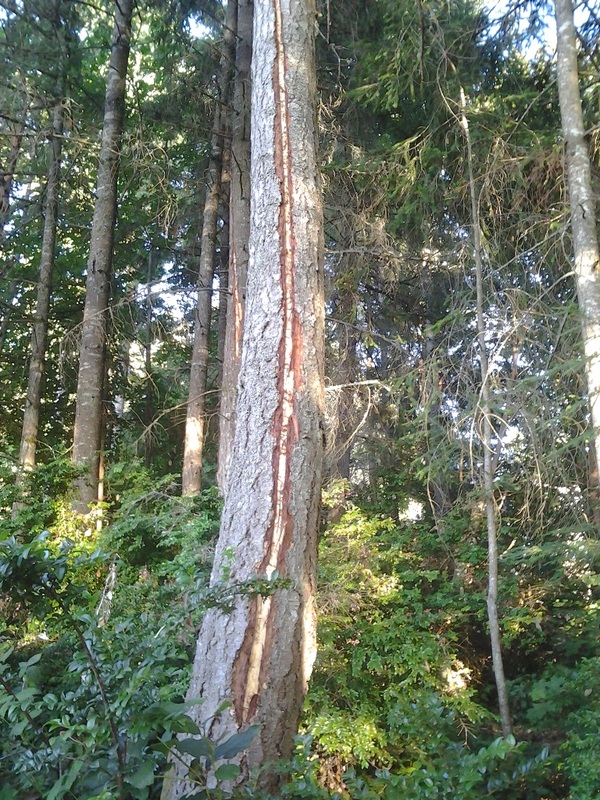 Damage caused by a lightening strike on Douglas Fir. Habitat: Douglas Firs grow in moist to extremely dry sites. 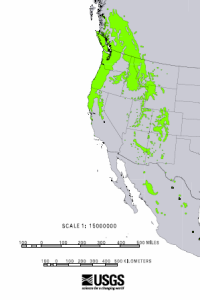 In ecological terms they are considered both early-successional (they are one of the first trees to colonize an area after a disturbance) and late-successional (they often occur in old-growth forests, just because they live so long– up to 1300 years!). 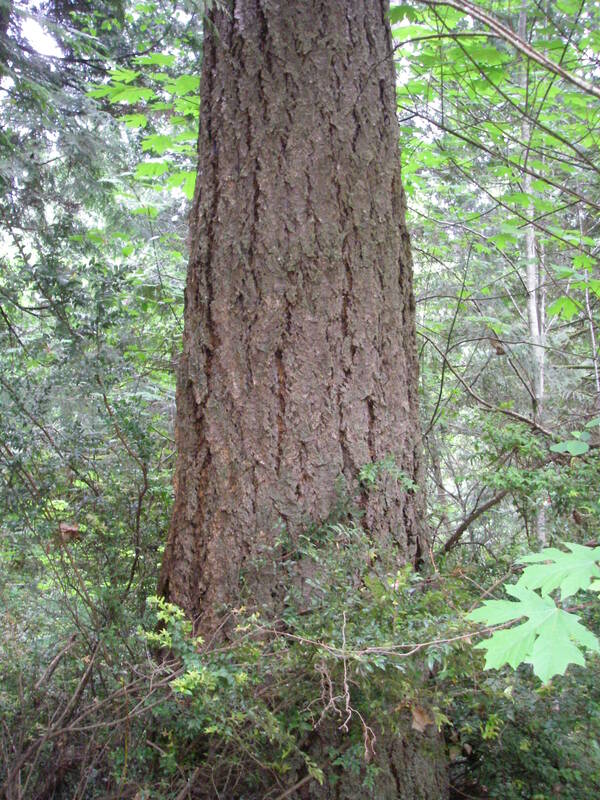 Douglas Fir is a primary component of moist forests in the Western Hemlock ecological zone. Infrequent, widespread, stand-replacing fires, (usually caused by lightening strikes) naturally occur at perhaps 400- to 500-year intervals. Wetland designation: FACU, Facultative upland, it usually occurs in non-wetland but is occasionally found in wetlands. 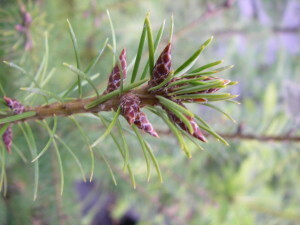 Diagnostic Characters: Douglas firs are easy to recognize by their “groovy” bark, pointed buds, and cones with 3-pronged bracts. Young trunks or branches often have “resin blisters,” that are easily ruptured; this sticky pitch is very difficult to wash off your hands! 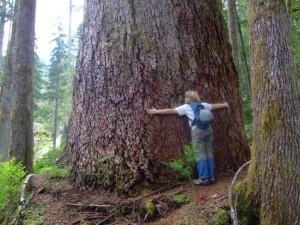 In the landscape: Douglas fir is a majestic tree. It will grow in extremely dry to moist sites. When growing in a container, it is often spindly and not very attractive, but once it is planted in the ground, out in the open, it will quickly develop into the familiar, pyramidal Christmas tree shape. On the down side, it is often the bane of golf course and park workers after a windstorm. 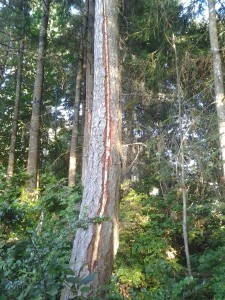 Because it is a fast growing tree, the new wood is relatively weak, and broken branches fall to the ground and must be picked up before grass can be mowed. For the same reason you may wish to avoid planting it next to buildings and other highly maintained areas such as courtyards and thoroughfares. 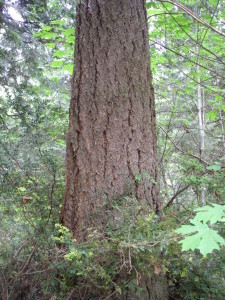 Douglas fir trees grow with a “central leader.” This is what forms the single trunk. 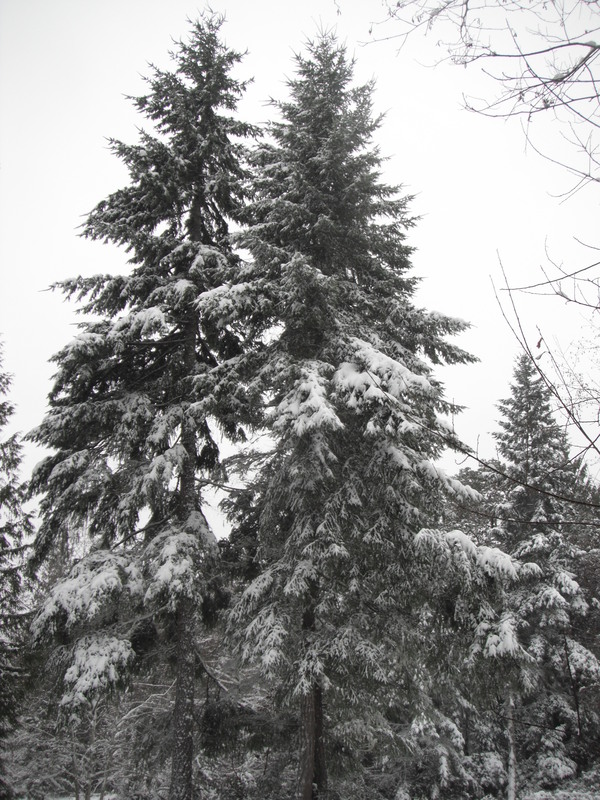 As with most conifers, it is important never to “top” these trees. In young trees, it is possible to prune or train damaged or disfigured trees so that they have only one leader. Trees that are allowed to have more than one leader, besides being unsightly, will have a weak point where the two leaders emerged; creating a likely spot for a future break. Phenology: Bloom Period: March-June, earlier in southern coastal areas, later at high elevations, interior and northern stands. Cones mature in mid to late September, seeds are dispersed soon after. 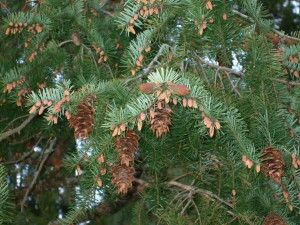 Propagation: Seeds of Douglas Fir have about a 40% germination rate with a stratification period at 40ºF (4ºC) for 60 days. Seeds remain viable 1-2 years. Volunteers in the landscape may easily be transplanted. Use by People: The Douglas fir is the most important timber tree in the United States. It is used for dimensional lumber, plywood and many other building materials as well as paper products. It was mostly used for firewood by native peoples but the wood was also used for tools such as spear and harpoon shafts. 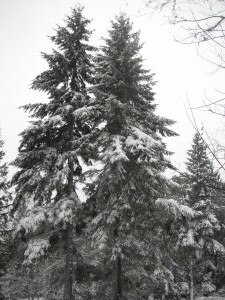 Today it is still commonly used for firewood and is well known as a popular Christmas tree.–See Selecting a Christmas Tree on my sister website, habitathorticulturepnw.com ! There are two versions of a Native American Myth relating the story of a frightened mouse looking for someplace to hide. In one version the mouse is trying to evade a fox, in the other the mouse is trying to escape a forest fire. 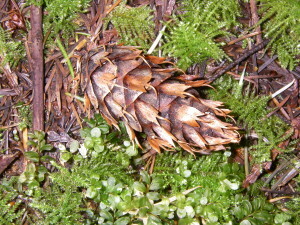 In both versions, the mouse tries to hide in a Douglas Fir cone. The mouse was successful in evading the danger in both stories. 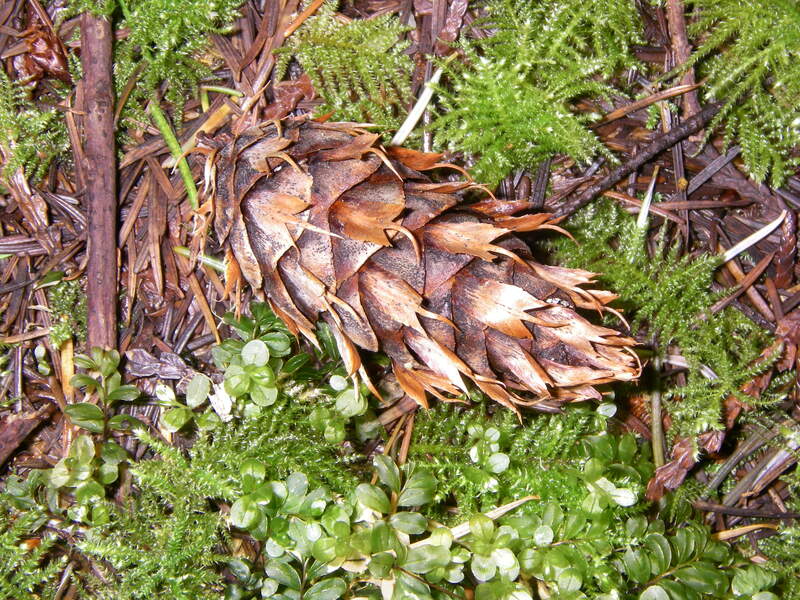 To this day, when you look closely at a Douglas Fir cone, the mouse’s back legs and tail are still visible beneath the cone’s scales! This entry was posted in Conifers on January 27, 2014 by habitatdana.